BumChum was conceived to fulfill the need for a healthy and rash free diaper, that did not break the bank.. I went through the ordeal every new mother goes through. To find a diaper brand that was easy on the pocket, and that would not cause a rash or be harmful for my baby. Choosing the right brand for the scorching Indian summer was hard. And cloth diapering was a hassel with all the other work that came along with a small baby. From there on was born the idea of a diaper that was healthier, affordable and complete. BDiapers is hybrid diaper that is both reusable and disposable . 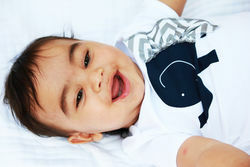 B Diaper comprises of a soft cotton cover and a diaperpad made from chemical free and frangrance free bamboo fiber. The diaper pad is disposable and can be replaced within the waterproof pouch of the reusable cotton covers. Each diaper cover is paired with a cute matching Tshirt that doesn't ride up when the baby is carried.B Diaper pads are toxin free and healthier as they do not cause rashes. The cotton cover ensures passage of air to prevent any growth of bacteria. BumChum incorporates modern comforts in traditional products that promise to improve the health of your baby and the world they will grow up in. We believe in the wisdom of the past generations in raising healthy, happy babies. We also believe babies need to look cute and stylish and be comfortable and healthy - all at the same time! From asthetics to ethics and everything in between we believe in leading by example !